FOXBOROUGH, Mass. — The father of Texas Senator Ted Cruz delivered a speech on the Constitution in Massachusetts this past week, where he also discussed the biblical guidelines for voting. 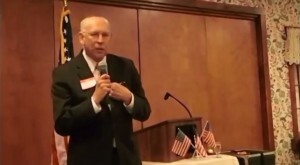 Rafael Cruz, the 74-year-old North Texas pastor and director of Purifying Fire Ministries, was the featured speaker on Friday at a Foxborough dinner hosted by radio personality Jeff Kuhner. He gave a one-hour presentation to those gathered. Cruz then pointed to the account of Moses’ discussion with his father-in-law Jethro, as outlined in Exodus 18, where God spoke through Jethro in regard to how leaders should be chosen among the people. “[H]e gives four qualifications: able men, such as fear God, men of truth, hating covetousness,” he outlined. Cruz defined each qualification in detail, focusing especially on the requirement that the candidate fears God and that they be a man of truth. The Cuban-born pastor then noted that the biblical hierarchy of appointing rulers to oversee thousands, hundreds, fifties and tens was the “equivalent of federal government, state government, county government [and] local government.” He commented that as the people were only to take the most important cases to Moses, the lower-level government was to handle the majority of matters. In addition to serving as a pastor, Cruz is also a professor of Bible and Theology and is the president of Kingdom Translation Services. He has been featured at a number of political, family-oriented and Christian events nationwide.